Where is the Codeacademy or Treehouse for Selling? 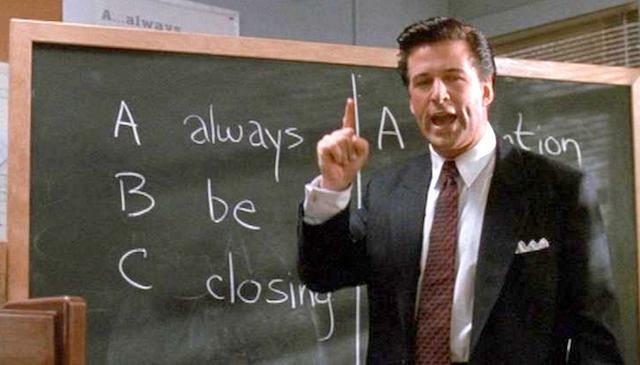 Alec Baldwin, real estate agent, exhorting his real estate peers to sell! While most young entrepreneurs or tech-minded folks today may recognize Alec Baldwin as the character in “30 Rock,” they would also be well-served to check out his gripping performance in David Mamet’s ruthless 1992 play “Glengarry Glen Ross.” His emphatic speech on selling (“Always Be Closing!”) delivers a key line that has always held true for businesses since good and even bad products still have to be sold to generate revenue. Yet in the past year or so, those looking to enter the startup game have constantly been inculcated with a need to code via popular firms such as Codeacademy or Treehouse with minimal focus on how to sell your product. This approach seems incredibly myopic. Below are three key takeaways on this situation and opportunities to rectify it. If you survey the catalogs of leading business schools, you will be hard-pressed to come across a major or concentration for “Sales.” Sure, you can learn these skills at well-equipped juggernauts such as SalesForce, but that’s neither feasible for most new tech ventures nor is it possible for them to provide high quality training to new hires without a formal knowledge base. Even a quick Google search for companies looking to offer this training to startups yields one unfamiliar result. This situation is untenable and signifies a glaring market need. The image of salespeople may suffer from a historical negative image, but there needs to be a reframing of its importance in today’s business education and priority as a skill level in line with coding or quantitative analysis by all players in the startup ecosystem in order to grow the funnel of salespeople. 2. Coding will become commonplace, so sales and distribution will be vital. Mark Roberge (@markroberge), SVP of Sales and Services at HubSpot recently alerted me to the notion that good salespeople always have multiple job offers (3 by his account). By the laws of supply and demand, this means that these in-demand resources will command higher prices that cash-constrained startups will be challenged to afford. While startups or tech firms in general struggle to find and retain technical talent now, the proliferation of resources to develop this engineering base will eventually make coding a commodity in the long-term. However, opportunistic individuals should realize that there will be another emerging market for top-notch salespeople. “Figuring out how to distribute and sell your product may prove more crucial” as Benjamin Schipper, co-founder of outsourcing development firm Happy Fun Corp mentioned to my PM101 class. Sam Clemens (@scclemens), CoFounder at InsightSquared, noted in our “Launching Tech Ventures” class that there should be “no excuses why you cannot learn how to code” with the wealth of resources out there. This statement could potentially hold true for sales or in the extreme, require the possession of both skills. VCs, business schools, or the startup community should be the driving force behind this revolution to rethink sales education. I envision that we’ll see companies or schools that focus on sales training in the near future, and clairvoyant investors should seek out these opportunities. Listening to Mark Roberge in class distill his methodology for finding good salespeople made it clear to me that there has been a lack of sophistication from the market in understanding this field, but I am optimistic that soon there will be disruption in this space. Recapping the main theme of this post, those that have an interest in the entrepreneurial ethos of the next several years should be espousing not only “Always Be Hacking” or “Always Be Failing” but also “Always Be Closing.” In no time, everyone will be able to build something, but the bigger question becomes can you sell it?